On a convoy with collegues returning from leave this near accident happened. Luckily the driver of the truck stopped in time or else we would have not enough room in our ambulance. The truck, a 'four tonner'/'viertonner' (a DAF, a real dutch product !) was not only used for cargo but also for personnel transport. Some old matrasses for absorbing the bumps in the road were thrown in the cargo bay and that was it. No safety belts or anything. Nowadays this mode of transport is abolished in the dutch army (please correct me when I'm wrong). This photo shows the dangers of using this transportion method for personnel. Anyway, a few months later all the transports were using 'normal' roads paved with tarmac and ordinary busses or coaches for transport ! watjes ! 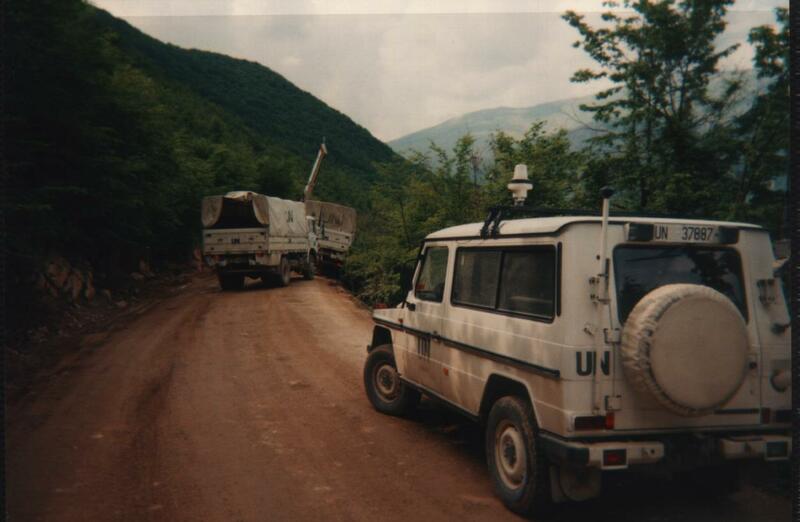 In the photo the truck on the right is connected with a cable to the rear of the truck on the edge of the cliff. The tow truck (parked behind the cliffhanger truck) is using it's hoist beam to lift the front of the truck back on the road. I can't remember if we had to wait for the tow truck to come all the way to this spot or if it was on the same convoy, it was not a standard vehicle of the convoys (ambulances were). This near accident happened on the way to Busovaca, on the last part of the Triangle route close to Prozor ('window' in Serbo-Croatic, because of the beautiful scenery) if I remember it correctly.